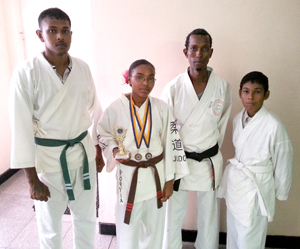 Portia Schepmyer of The Mixed Martial Arts Karate Association of Great Diamond was outstanding in an International tournament held in St Lucia recently. Portia Schepmyer (2nd left) along with (from left) Chetram Ramdial, Master Lloyd Ramnarine and Phillip Jaikissoon. The 23-year-old petite young lady claimed a gold medal in the Traditional Forms and bronze in the Weapons and Sparring competitions at the St Lucia Piton Open International Martial Arts Festival dubbed ‘Armageddon’. She noted that the competition was very challenging but she found it a joy and is proud to represent Guyana and turn in commendable performances. She was the lone Martial Artist to make the journey of a planned four member team that was scheduled to go but due to lack of funding the remainder were unable to travel. Schepmyer expressed thanks to those who assisted her in realising the necessary finances. Among those mentioned are the Management and staff of Bounty Farm, residents of Kuru Kururu, her friends and family. She is trained by Master Lloyd Ramnarine, who indicated that they recently opened outstations at Parfaite Harmonie and 2261 Westminster, Bel West, No2 Canal . For those interested in joining contact can be made with telephone numbers 698-6727 and 686-7369.